22 March is observed as “World Water Day” every year. The theme for 2019 is “Leaving no one behind.” Right to left: Water for all older people, Water for all refugees, Water for all rural people. Most of us start our day with a glass of water as many people believe it helps eliminate toxins and cleanses our system. Our body comprises around 60% of water and even a slight decrease in the water content (1-3% fluid loss) can impact the cognitive and physical functioning. But how much water should you drink in a day? What are the benefits of drinking water? What will happen if you do not drink enough water? Here’s a quick peek into why water is essential for life. According to numerous research studies, there is no ideal recommended intake of water. However, all across the internet and in certain books, it is reported that drinking six to eight glasses of water every day is good for health. But there is no evidence that drinking less water can cause any harm. However, a study titled “The Hydration Equation: Update on Water Balance and Cognitive Performance” revealed that the recommended intake of water is 3000 ml for men and 2200 ml for women. This means around 12 glasses of water for men and around 9 glasses of water for women per day, which is more than adequate. Bottomline: There is no ideal recommended intake of water, however, you must drink adequate amounts of water to stay hydrated. Warm water vs cold water: Which is better? According to a study published in the International Journal of Clinical and Experimental Medicine, drinking cool tap water (16 degrees celsius) is good for health. The study was done to evaluate the effect of water temperature and voluntary drinking on the post rehydration sweating and revealed that drinking cool water (and not refrigerated water, water at room temperature and warm water) reduces water intake. Moreover, it also showed a lower sweating response and efficient hydration, especially in the case of dehydration. Bottomline: It is advised to drink cool, room temperature water and not cold or warm water. Drinking water with meals: Yes or No? 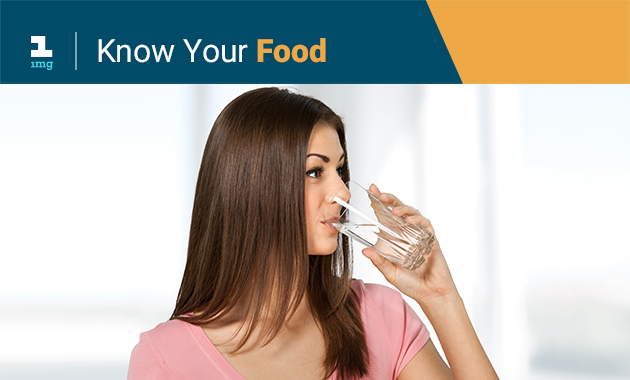 A common query that bothers most people is whether is it a good idea to drink water with food. This is because it is believed that drinking water with meals affects the feelings of satiety and hunger. However, this is not true. It was concluded in a study published in the European Journal of Clinical Nutrition that no effect was observed after drinking water during and after a meal. However, it is advised to stay away from other fluids such as carbonated and sugary beverages as it might interfere with the overall energy intake. Bottomline: Drinking water along with meals is not shown to cause any considerable effects on the overall health. Drinking water for weight loss: Does it help? Drinking water before meals is one of the most common weight loss tips followed by people. And if research studies have to be believed, doing so can help. Yes, a 2013 study published in the journal Australian Family Physician revealed that drinking 500 ml water around 30 minutes before meals can help in weight loss. However, it has to be used in conjunction with a low-calorie diet. But this intervention works for middle-aged people who are overweight or obese. Also, if you suffer from cardiac complications or have severe renal impairment, this technique is not recommended. Bottomline: Consult your nutritionist before you try this simple weight loss trick to know if this can work for you or not. Water is needed for survival so much that without water, humans can only survive for a maximum of four days. Here are a few common health benefits of drinking water. Lack of water can cause dehydration, which may lead to altered body temperature and concentration and lack of fatigue. But staying hydrated when exercising can help you to prevent dehydration and improve physical performance. Hence, if you are performing any strenuous workout or indulge in physical activities, ensure you stay hydrated by drinking water or fluids. It is reported that mild levels of dehydration can impair mood and cognitive functioning. However, this effect can be reversed by drinking water and staying hydrated. Intake of water can cause increased alertness, memory and concentration. One of the common triggers for headache and migraine is dehydration. Studies have reported that drinking water can help to treat headaches in people who are dehydrated. Moreover, it can also reduce the intensity and duration (in certain cases) of headache. Constipation is a common gastrointestinal condition that causes difficulty in passing stools. Reduced water intake is a known risk factor for constipation in young as well as older adults. Hence, it is recommended to drink plenty of water to prevent and relieve the symptoms of constipation. Kidneys play a crucial in regulating water balance and blood pressure along with removing waste from the body. But limited intake of water can lead to kidney stones due to the accumulation of toxins in the kidneys. Hence, drinking more water is recommended as it can maintain the urine output. 2. Riebl SK, Davy BM. The Hydration Equation: Update on Water Balance and Cognitive Performance. ACSMs Health Fit J. 2013 Nov;17(6):21-28. J Clin Nutr. 1993 Nov;47(11):815-9.
consumption for weight loss. Aust Fam Physician. 2013 Jul;42(7):478. Sleep Apnea: Why Do Men Snore More Than Women?